It was spring in Toronto. This weather is beyond confusing. 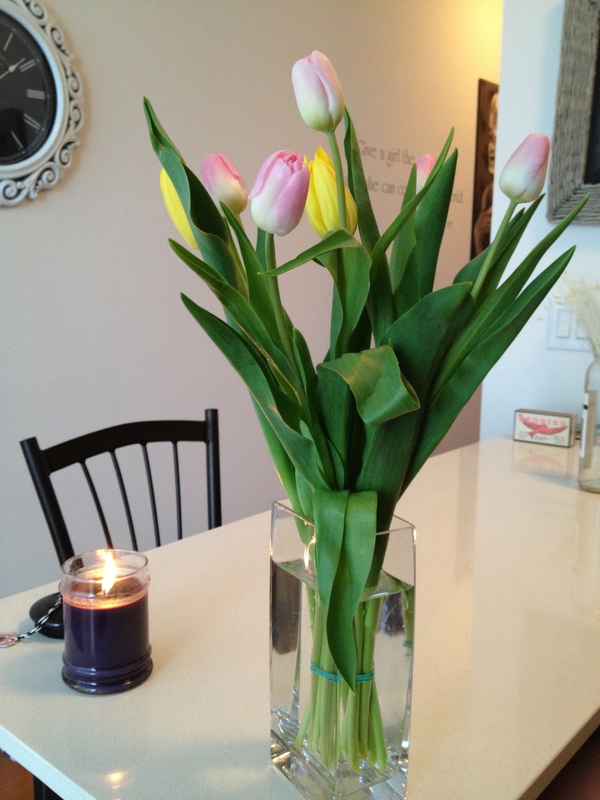 Even my tulips don’t want to stand to attention today. But they did look beautiful on Saturday! This past weekend I went to the market and picked up everything I would need for a delicious salad for the week. My Big Book of Salads has really opened my eyes to the combinations that can be made with a few ingredients. 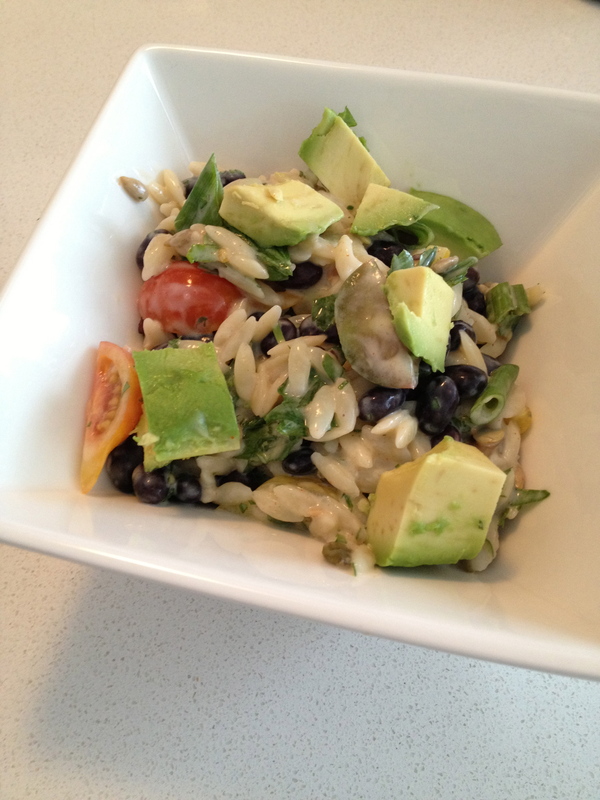 With a few modifications, based on what looked lovely at the market, here it is – Orzo Salad. Cook orzo pasta according to the directions on the package. I buy in bulk from the market to eliminate packaging, and simply keep my eye out for when they look tender (taste to make sure!) Quarter the tomatoes, sliver the onions and add to a bowl with black beans. When the pasta is done, add to the mixture. Combine buttermilk through garlic in a small bowl, whisk and pour on top of the pasta mixture. Stir and serve with avocado and seeds! Tip: you can add parsley at the end, but I wasn’t a big fan of this flavour, and will omit next time. Cooking is all to your taste, so add or subtract based on that! What a journey the past few weeks has been! The Mind・Body・Soul series started when I went back to school in January. A little on that: currently, I am taking my Certificate in Digital Strategy and Communications Management at the University of Toronto. Our class is a group of fine folks and instructors who have been both motivating and inspirational. One of our assignments was to create a blog, and write 16 posts. But, I already have my blog! Instead of creating a new space, I created a series on Food with 3 perspectives: the Mind, the Body and the Soul. What I must say is thank you. I can’t thank everyone enough for reading my recipes and leaving your comments. 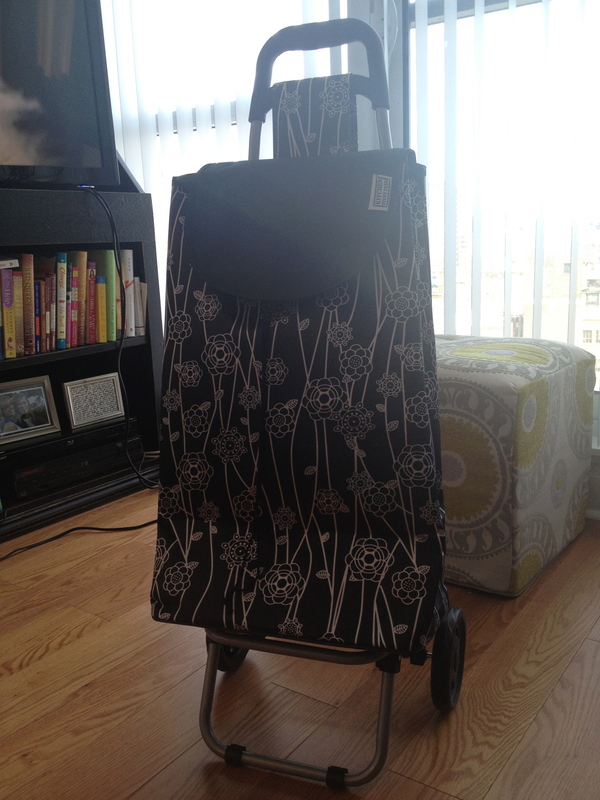 Because of you, I am keeping up the newest addition to my blog! I will still be cooking up a storm, and leaving my recipes in the “Food and Wine” section. You can also look for recipes easily by Recipe: ____ as the title. Let me know if you try something, and what you thought! I have realized that while home may be where the heart is, the kitchen is where my soul is. As it was mentioned to me last week by a friend, my first ingredient, even though it isn’t listed, is always love. And, you’re always welcome at my table. Yesterday I posted my recipe for Honey Mustard Pork Tenderloin, but you obviously need something to serve it with! Insert, grilled asparagus. Nothing is worse than asparagus gone wrong. But when it’s right, it is oh-so-right. Tender with a bite! I love asparagus done simply, with a squeeze of lemon when it hits the plate. Enjoy! Marinate the asparagus spears in olive oil – drizzle, turn and drizzle again. Season with salt and pepper. Let them sit for 30 mins before putting them on the grill. 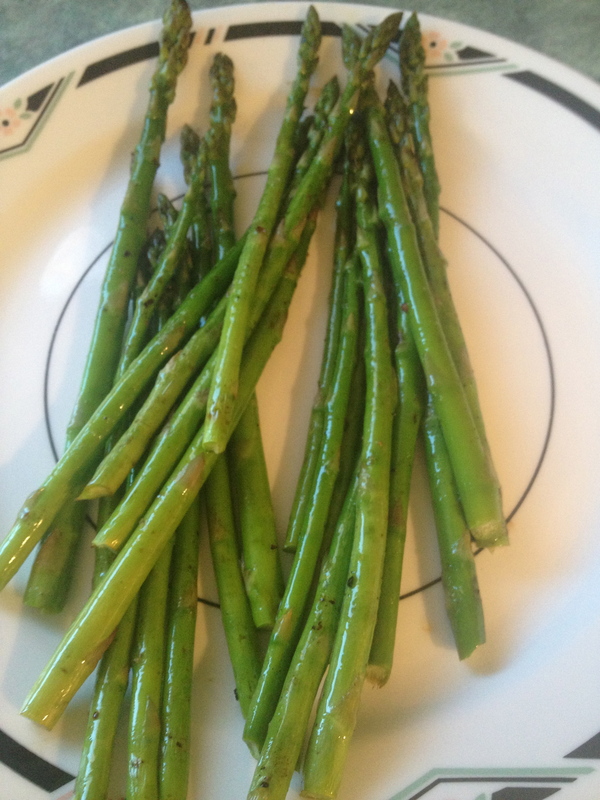 On direct heat, grill asparagus for 5 minutes, turning each minute. Once they are done, squeeze with lemon! Fun Asparagus Fact: your pee may or may not take on a new odour, apparently it has to do with genetics! Ohhhhh, science. Tis the season, and there’s no better weekend to spark the Q than Easter. 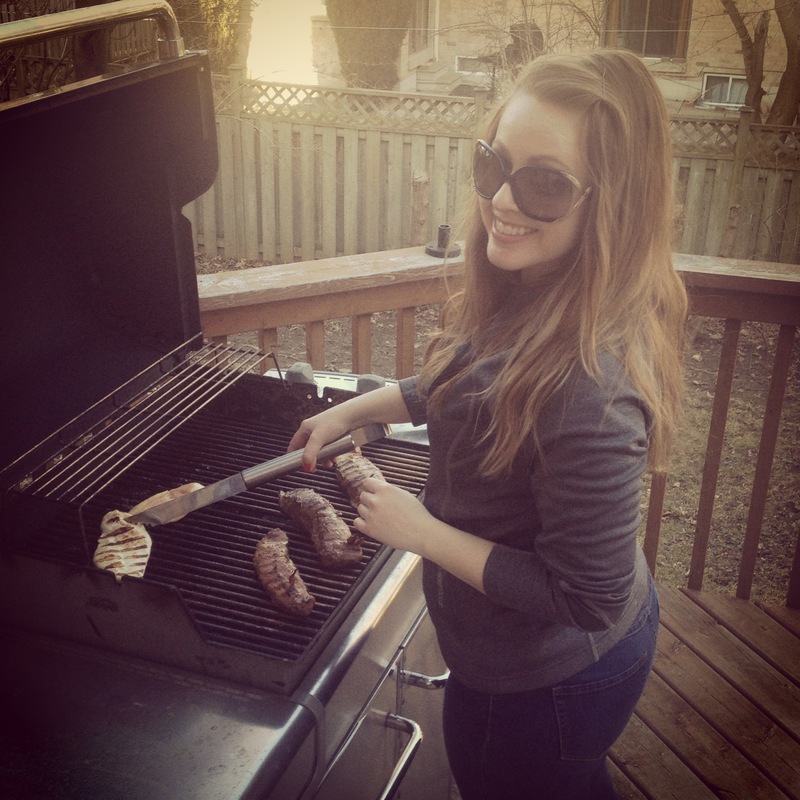 My family is nor Catholic, nor Jewish, so we wanted pork tenderloin on Good Friday. One of my favourite things to do is cook with my Mom, although I am sure she hates being dethroned as Head Chef in the kitchen (sorry, Mommy). We cooked up the idea to use up some honey and rosemary that she had on hand. It’s a great way to get creative in the kitchen. 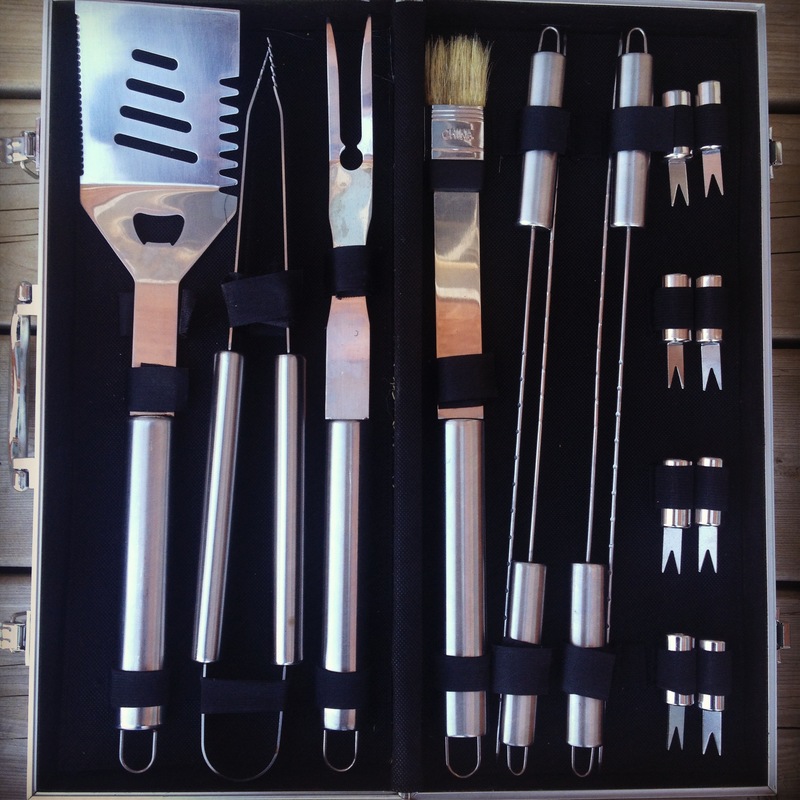 Grilling isn’t easy, you have to be patient. But when done right, the results are delicious! Season the pork tenderloin on both sides with salt. Slide into a large resealable ziplock bag. In a medium bowl mix together honey, dijon mustard, chili powder, and rosemary. 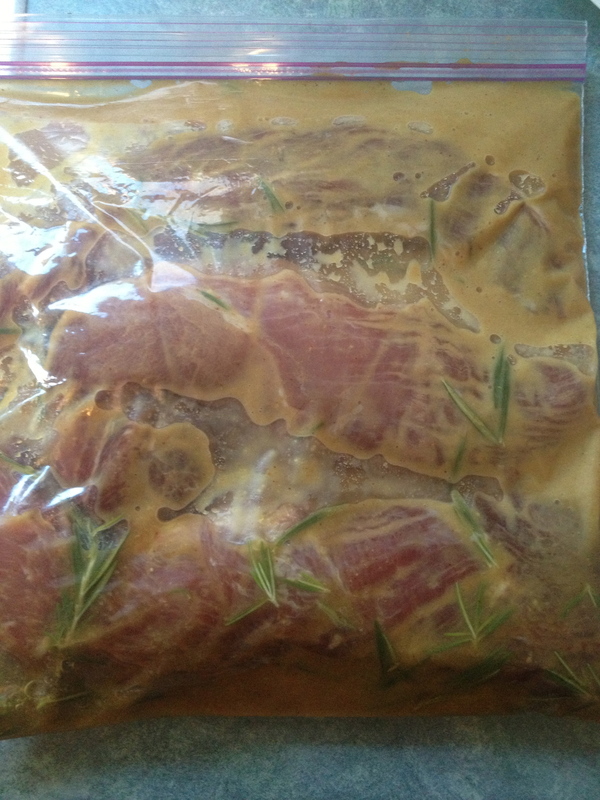 Pour most of the marinade over the pork tenderloins, seal the bag, and refrigerate for at least 4 hours. Reserve some for basting. After the meat has marinated, prepare the grill for indirect heat. I’ll explain this below. Lightly oil the grill grate, after you have scraped it down. 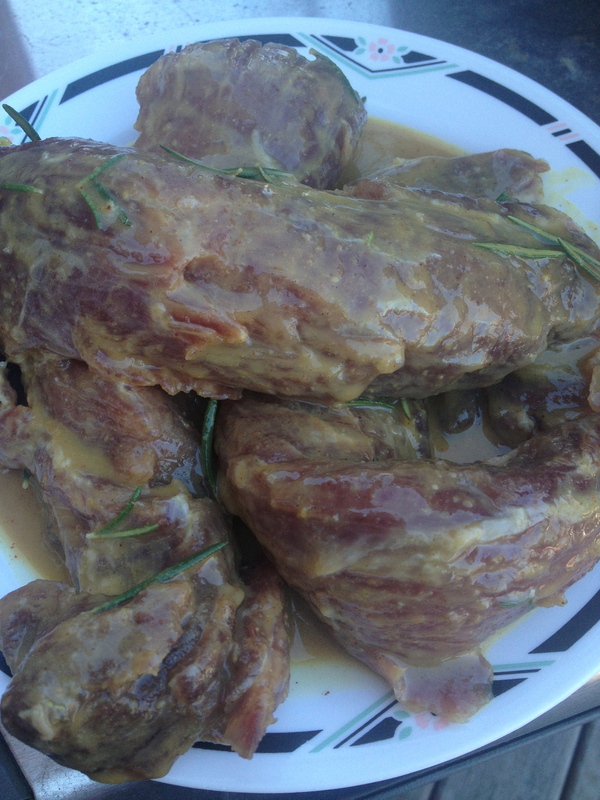 Remove the pork tenderloin from the marinade, and discard the liquid and 3 whole sprigs of rosemary. Grill on direct heat for 4 minutes per side to get a good crust and grill marks. Place over indirect head for another 22-27 minutes. Baste after each turn. Pork should have an internal temperature of 77°C. Remove from the grill and tent for a few minutes. Slice and serve! Indirect Heat: Turn 1 or 2 burners on high. Placing the meat on the burners will be direct heat, on the side without a burner is indirect. Wine Pairing: depending on the amount of chili powder you put in, this pork will be sweeter or a balanced sweet and spicy. 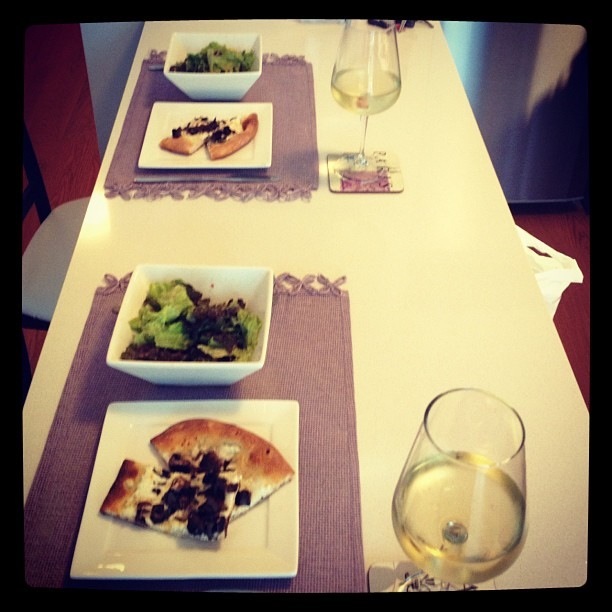 Ours was a bit spicy, so we paired with a glass of 2011 Beringer Sauvignon Blanc Napa Valley. With bright aromas of guava and melon and flavours of pineapple and citrus, it balanced out the pork just nicely. 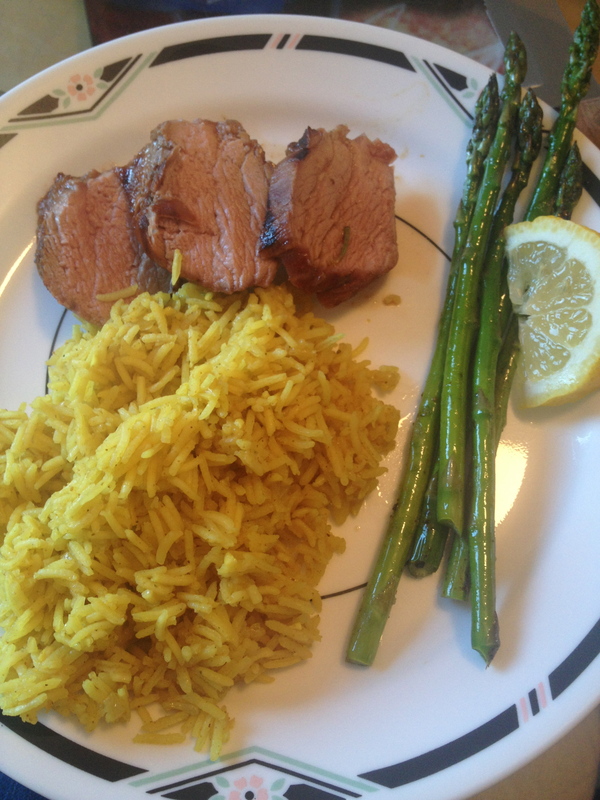 I served with curried rice and grilled asparagus, which I will post tomorrow! Champignon… used to be my favourite word to say en français in grade 7. I said it all day on Sunday when I decided to take my new wheels for a ride. You’re jealous, I know. 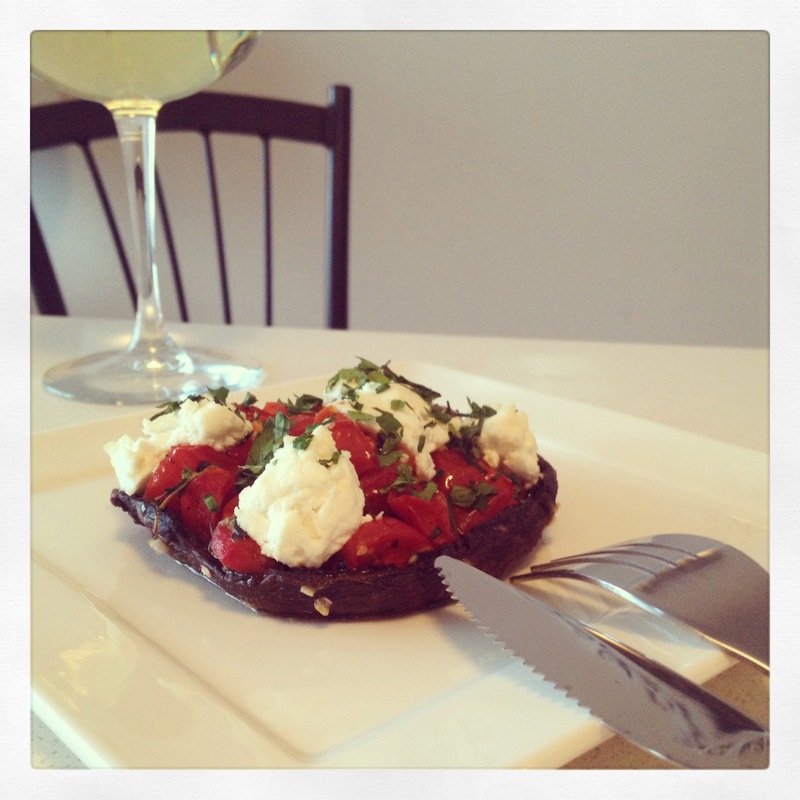 While on the way to the grocery store, I had a giant craving for portobello mushrooms, hence the champignon chatter. It had been a while since I made them, in the summer to be exact. Portobello mushroom cap burgers are divine, but that’s a post for a different day. I had cherry tomatoes and goat cheese in the fridge just waiting to be used, so I picked up herbs and mushrooms, and had a delicious, and meatless, Sunday dinner. Also, I paired this with a white VQA. Hillebrand – Artist Series – 2011 Sauvignon Blanc. Worked well with the amount of goat cheese I had dotted on! First, start by making the tomatoes. I make these all the time to put on top of fish! Pre-heat your oven to 375 degrees, and pour a glass of wine – you deserve it. Line a cookie sheet with parchment paper. 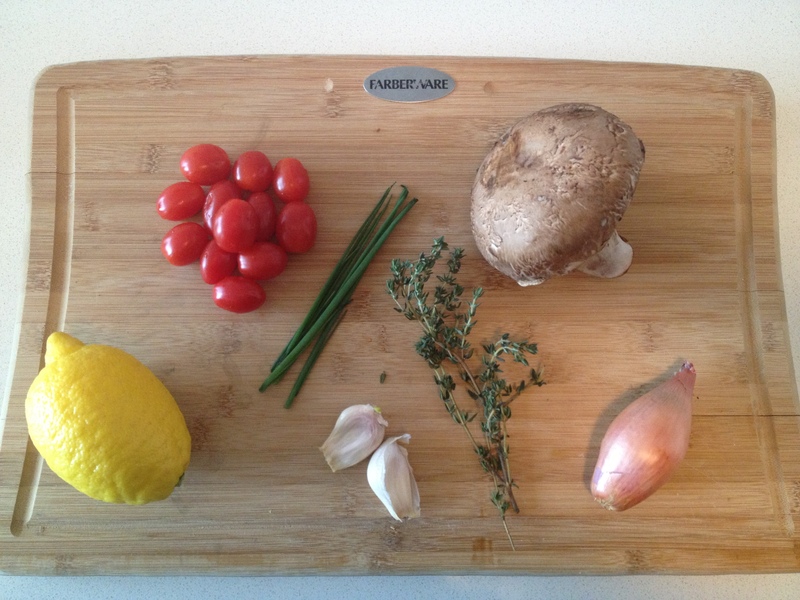 Halve the tomatoes and toss them with oil, 3 of the 5 garlic cloves, the thyme, salt and pepper. 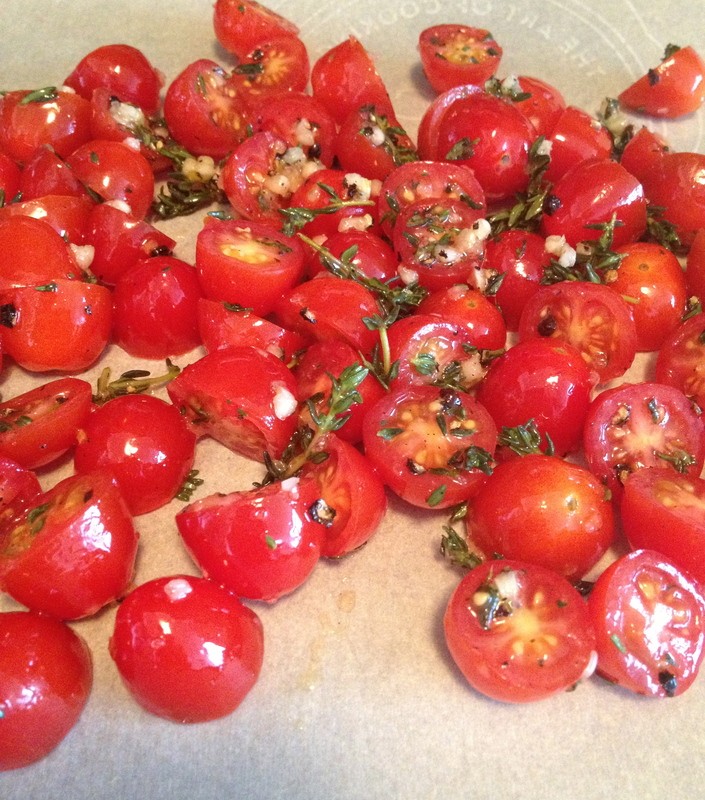 Place tomatoes on the baking sheet and roast them for 25 minutes until browned on the edges. 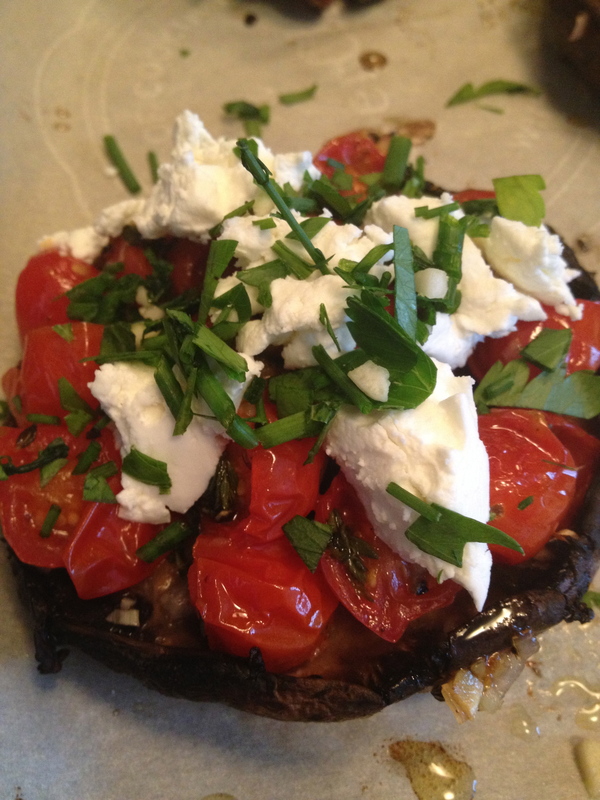 While the tomatoes are roasting, wipe off the portobello mushrooms with a damp cloth (do not wash them! They are like sponges.) Lightly tug at the stem to remove it. Take a spoon and clean out the gills. I do this when making mushroom burgers as well, it gives your toppings a place to go. In a small bowl, whisk together the olive oil, lemon juice, shallot and the rest of the garlic. Brush the mushroom caps on both sides with the mixture. Season with salt and pepper. Once you’ve removed the tomatoes, pre-heat the broiler. Broil the mushrooms for 5 minutes until they start to release some juices. Remove them and fill with roasted tomatoes. Pre-heat the oven to 375 degrees. Fill the caps with the roasted tomatoes and add the goat cheese. 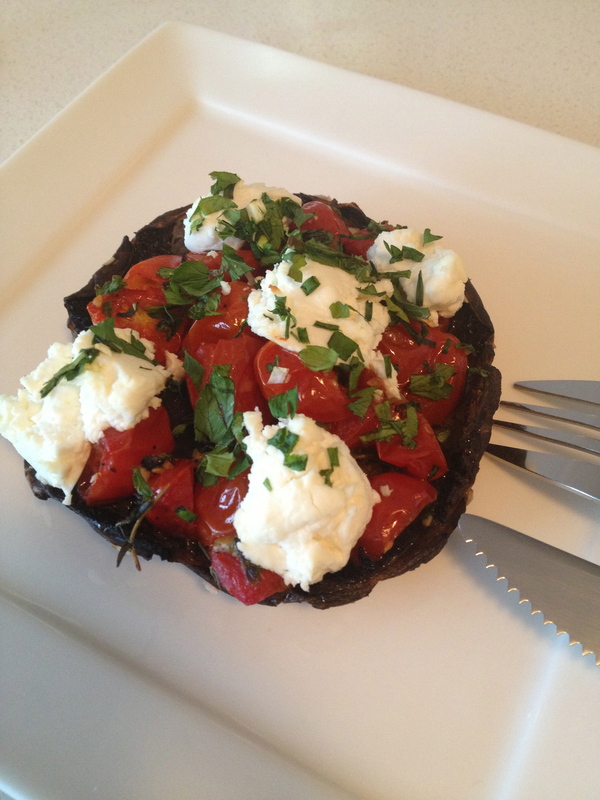 I love goat cheese, so I add quite a bit, but you can omit if you’re not into dairy, it will be good without it! Sprinkle with the rest of the fresh herbs. Place back in the oven and bake for 15 minutes. Remove and enjoy! This is a wonderful appetizer, but I ate 2 for a meal and it was perfect.